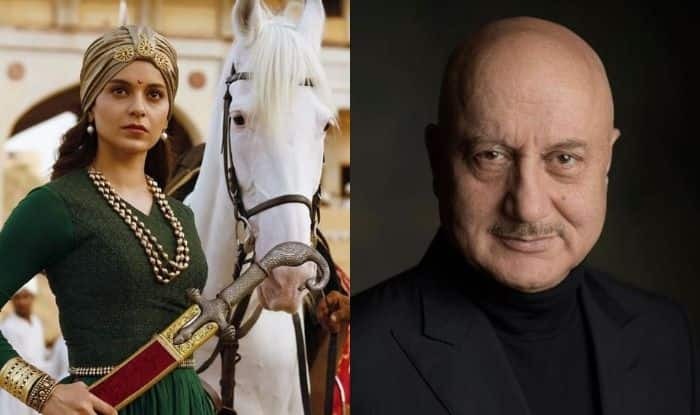 Anupam Kher has come out in support of Kangana Ranaut and called her a "ROCKSTAR"
Kangana Ranaut’s film Manikarnika: The Queen of Jhansi has been under controversy ever since it was in the making. She had earlier claimed that Bollywood celebs have not supported her film just because she earlier spoke about nepotism. Now actor Anupam Kher has finally come out in support of the actor and called her a “ROCKSTAR”. Anupam recently conducted #AskAnupam on his Twitter handle where a Twitter user had asked him to tweet something in Kangana’s support. the tweet read, “#AskAnupam nobody from Bollywood is supporting Kangana’s Manikarnika movie. Can you please tweet in her support?.”Replying to this, Anupam wrote, “#KanganaRanaut is a ROCKSTAR. She is brilliant. I applaud her courage and performances. She is also the real example of #WomenEmpowerment.:)”. Earlier, during a media interaction, Kangana slammed Bollywood celebs for not coming out in support of the film. She stated that just because she spoke about nepotism in the past, people have ganged up against her. Kangana has vowed to expose everyone in Bollywood. PTI quoted her as saying, “Is Rani of Jhansi my aunt? She’s as much mine as she’s yours. Then why are these people scared? They are worried just because I spoke on nepotism? They have formed a gang: ‘Why did she speak on nepotism?”. “They have all gathered together, like a classroom where 59 have ganged up against one, trying to bully one. How will you feel if someone did that? Aren’t they ashamed? Some of them are my grandfather’s age. “They are after me. Don’t they feel ashamed that it’s not about me. I don’t even want to work with them and I’ve said that often,” she added.